Group picture of participants of an inception workshop for a project to improve vaccines for the control of East Coast fever in cattle in Africa. 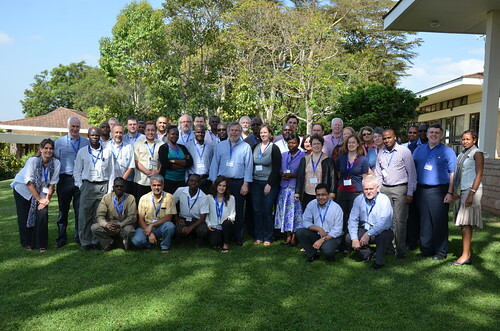 The workshop was held at ILRI’s Nairobi campus 27-29 January 2014 (photo credit: ILRI/Paul Karaimu). A new East Coast fever vaccine project, supported by a USD11-million grant from the Bill & Melinda Gates Foundation (USA), is receiving additional support coming from partners in a new consortium established to battle this African cattle killing disease. These partners/investors include the Centre for Ticks and Tick-Borne Diseases (Malawi); GALVmed, a livestock-oriented non-profit product development partnership (UK); the Institute for Genome Sciences (University of Maryland, USA); the Institute of Tropical Medicine Antwerp (Belgium); the International Livestock Research Institute (ILRI); the Roslin Institute (University of Edinburgh, UK); the Royal Veterinary College (UK); the United States Department of Agriculture-Agricultural Research Service (USDA-ARS); and Washington State University (USA). From the Global Times/Xinhua (China): ‘. . . The International Livestock Research Institute (ILRI) said on Friday the consortium . . . will develop the highly advanced cattle vaccine to battle East Coast fever. We need to get better control of East Coast fever because there are millions of people in East and Central Africa whose existence depends on healthy cattle, and right now they are losing about one animal every 30 seconds to this disease,” said Vish Nene, who leads ILRI’s Vaccine Biosciences Program and heads up this “improved vaccines for the control of East Coast fever” initiative. . . .
‘East Coast fever is a devastating cancer-like disease of cattle that often kills the animals within three weeks of infection. The vaccine can also help malaria and cancer research in humans. . . .
‘The disease was first recognized in southern Africa when it was introduced at the beginning of the twentieth century with cattle imported from eastern Africa, where the disease had been endemic for centuries, DFID said. ‘The disease is spreading rapidly and currently threatens some 28 million cattle in East and Central Africa. ‘It killed more than one million cattle in 11 countries — Burundi, the Democratic Republic of Congo, Kenya, Malawi, Mozambique, Rwanda, Sudan, Tanzania, Uganda, Zambia and Zimbabwe — and caused 300 million US dollars in losses in 2013. ‘ILRI said the researchers will focus on recent breakthroughs that have isolated proteins in the parasite, called antigens, likely to be crucial in protecting cattle from East Coast fever to develop the vaccine. Some of the antigens appear capable of stimulating production of protective antibodies. ‘Other parasite antigens could help endow the vaccine with the capacity to stimulate the cow’s production of a type of lymphocyte known as cytotoxic or “killer” T cells that are able to target and destroy the cow’s white blood cells infected with the parasite. Statistics indicated that about 70 percent of the human population of sub-Saharan Africa depend on livestock for their livelihoods, with farming and herding families relying on cattle for vital sources of food, income, traction, transportation and manure to fertilize croplands. ‘The East Coast fever team will ensure that the vaccine is made available, accessible and affordable to livestock keepers who need it most and to scale up its production for the future. Read the whole article at the Global Times (China) / Xinhua: Scientists launch bid to save cattle herds in Africa, 31 Jan 2014. Tags: BMGF, CTTBD, GALVmed, Institute for Genome Sciences, Institute of Tropical Medicine Antwerp, Roslin Institute, Royal Veterinary College, USDA-ARS, Vish Nene, Washington State University, Xinhua. Bookmark the permalink.